The Lion Rest Fitted Mattress Protector is designed to provide ultimate protection against allergens, bacteria, dust mites, perspiration, urine & fluids. It has a Fitted style that makes it easy to get on and off quickly. The Hypoallergenic encasement provides complete protection for a healthy and bedbug-free zone. The cotton terry surface is soft & noise free to give you the ultimate in mattress comfort and peaceful sleep without any interruptions. The Fitted mattress protector is 100% waterproof that provides complete protection from spilled liquids and perspiration. It also consist of Breathable membrane material which allows air to circulate for keeping everything fresh and dry even on the hotest nights. Dimensions: 38" x 75" x 9"
The Lion Rest Twin Size Fitted Mattress Protector has many exciting features for users of all types. 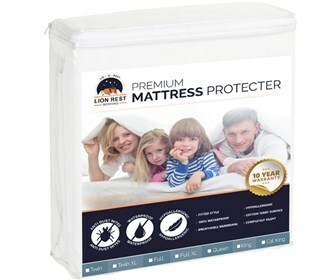 See the Lion Rest Twin Size Fitted Mattress Protector gallery images above for more product views. 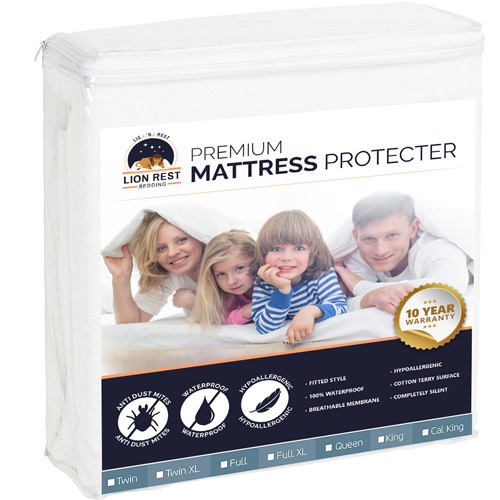 The Lion Rest Twin Size Fitted Mattress Protector is sold as a Brand New Unopened Item.